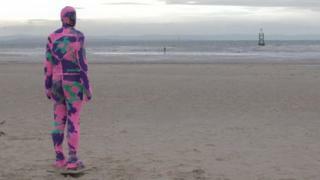 Two of sculptor Antony Gormley's iron men, which normally stand on a beach wearing nothing but rust and barnacles, have been given a multi-coloured make-over by a guerrilla knitwear artist. Part of Gormley's Another Place series, the life-size figures have been on Crosby beach in Merseyside since 2005. The head-to-toe crocheted outfits were added by New York-based artist Olek. "I feel that barnacles provide the best cover-up, but this is very impressive substitute!" Gormley said. One figure was given a pink, purple and green crocheted jumpsuit, while the other was clad in white, grey and black. Polish-born 34-year-old artist Agata Oleksiak, known as Olek, has previously surprised New Yorkers by giving the Wall Street bull similar treatment. She has also covered everything from cars and grand pianos to an entire apartment and its contents in her trademark colourful crochet. She said her outfits for the Gormley sculptures were "transforming old into new". "I think it is his most successful installation," she said. "The pieces have been there for a while and people stop paying attention to them. "By covering them and giving them a new skin, I made them more alive... besides, it is a public work and needs an interaction with a viewer." Gormley, who won the Turner Prize in 1994, installed 100 of the figures over a two-mile stretch of the beach. The outfits were spotted by the Liverpool Confidential website at the weekend. Olek added that she had wanted to dress all of the figures but was only in the area for one night, "travelling in a crocheted taxi from London across UK". She is now back in the US, installing a crocheted exhibition in Raleigh, North Carolina, before shows in Montreal and at the Smithsonian American Art Museum in Washington DC.